Spinal metastasis and hyperplastic hematopoietic bone marrow (HPMM) are two distinct clinical entities that greatly differ in terms of prognosis and management. The spine is a common site for metastasis, and outcomes are generally poor for patients with metastatic disease., HPMM meanwhile is a relatively benign condition and can be treated conservatively after addressing the underlying cause. It is often difficult to differentiate the two conditions both clinically even with radiographic investigations. Both conditions can have similar features on magnetic resonance imaging (MRI) imaging and radionucleotide bones scans and often pose a diagnostic dilemma.,, Biopsies are frequently required for definitive diagnosis, especially for equivocal cases. There is little research done so far with regard to a definitive scoring system or criteria for clinical or radiological differentiation of the two conditions. We report on a case of HPMM mimicking spinal metastasis. 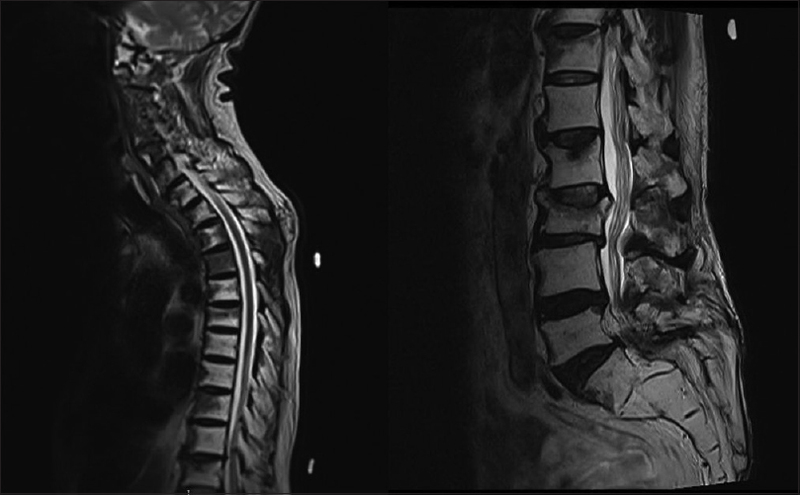 A 73-year-old male presented with a 3-year history of back pain following a fall from height. He also had associated anorexia and significant weight loss for last 6 months. The patient had a past medical history of a brain tumor for which he underwent surgical excision more than 20 years ago. The patient was unable to recall the details of the tumor or surgery, and medical records were unavailable. He was also an alcoholic, drinking up to 12 cans of beer daily. He was not a smoker and did not have any significant familial history. Examination of his spine was unremarkable with no significant midline tenderness or any neurological deficits. Hematological investigations did not reveal any anemia with a hemoglobin level of 14 g/dL or any cell count abnormalities. There was only an isolated increase in mean corpuscle volume of 98.3 fL likely secondary to his alcohol intake. Other serum tests for creatinine, blood urea nitrogen, calcium, inorganic phosphate, alkaline phosphatase, and c-telopeptide were unremarkable. Liver function test was also normal. HIV, tuberculosis, and hepatitis screens were negative. 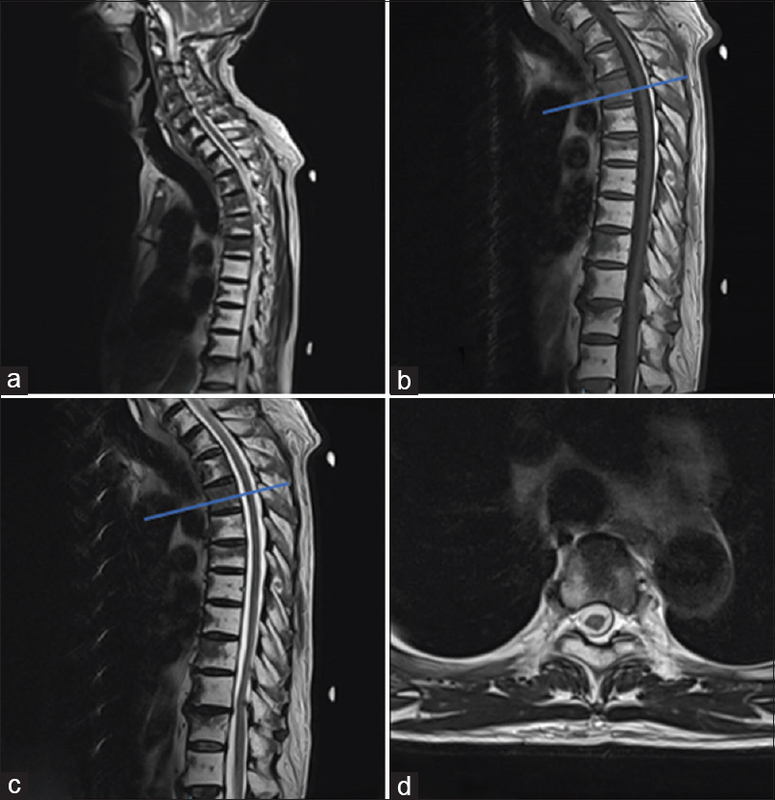 The initial MRI scan showed multiple scattered abnormal T1-weighted/T2-weighted hypointense foci distributed throughout the cervical, thoracic, and lumbar spine [Figure 1]. The short T1 inversion recovery (STIR) sequences did not demonstrate significant enhancement or abnormal marrow signal. Other findings included that of old healed compression fractures of T11, L1, and L2 vertebra, without enhancement on STIR images [Figure 2], [Figure 3], [Figure 4]. A subsequent bone scan with 99m Tc with methylene diphosphonate showed moderate foci of uptake in T4, T11, and L2 vertebra [Figure 5]. Based on the radiographic results, the radiologist reported that the spinal lesions were highly suspicious for underlying osseous metastases, and suggested further evaluation for possible malignancy. A computed tomography (CT) thorax, abdomen, and pelvis were performed for the patient which did not show evidence of malignancy. Tumor markers were also largely unremarkable apart from mildly elevated carcinoembryonic antigen of 7.68 ug/L. A subsequent follow-up esophageal-gastro-duodenoscopy and colonoscopy were negative for malignancy. Myeloma panel performed for the patient also did not demonstrate any abnormalities in serum protein electrophoresis, serum-free light chains, or urinary test for Bence–Jones proteins. Given that the T4 vertebra showed the highest proportion of signal variation and also significant increase in radionucleotide uptake, a CT-guided biopsy of the T4 vertebra was performed. Histological results were indeterminate. A close discussion was made with the patient, radiologist and the orthopaedic team and with the significant radiological findings coupled with due consideration to the constitutional symptoms and past medical history, a decision was made for an open biopsy of the T4 vertebra. He underwent open biopsy through posterior longitudinal incision with intraoperative fluoroscopy guidance under general anesthesia. Bone biopsy of T4 vertebra was performed with Jamshidi needle and spine biopsy needle through pedicular entry. Spinous process was subsequently excised as the spinous process also showed signal changes on MRI, and samples sent for histology [Figure 6]. The histology reports were spinal HPMM with trilineage hematopoiesis with a myeloid:erythroid ratio of approximately 3:1 and normal cell maturation. There was no evidence of increase in blasts. 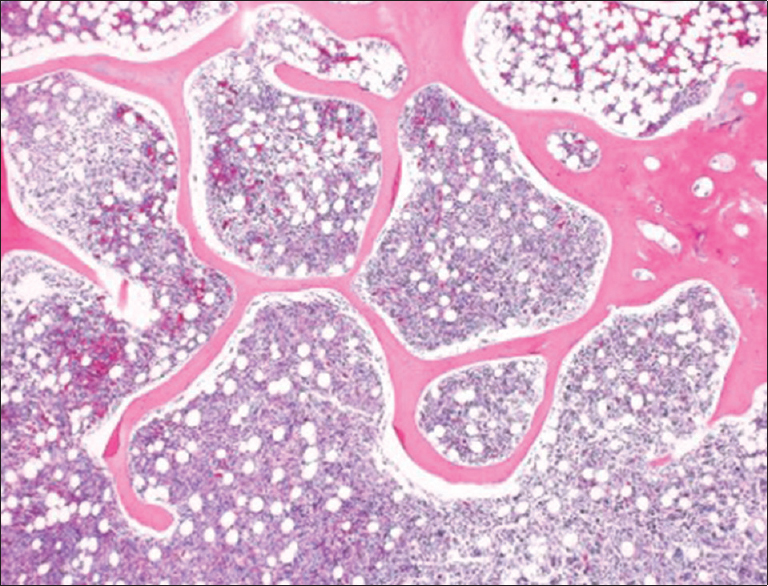 The histology was also negative for metastatic carcinoma, amyloids, myeloproliferative disorders, or granuloma [Figure 7]. The patient has since recovered well from the operation, and his chronic pain has been well controlled with physiotherapy and analgesia on 6-month follow-up. A repeat MRI also demonstrated stable lesions [Figure 8]. Abnormal bone marrow appearances on radiographic imaging of the spine can be due to a multitude of causes. Shah et al. have demonstrated that abnormal bone marrow signal on MRI was not inconsequential, and had a pickup rate of 6% of patients who were subsequently diagnosed with a malignancy. The spine is known to be a frequent site for metastasis and is the third most common site after the lung and liver. 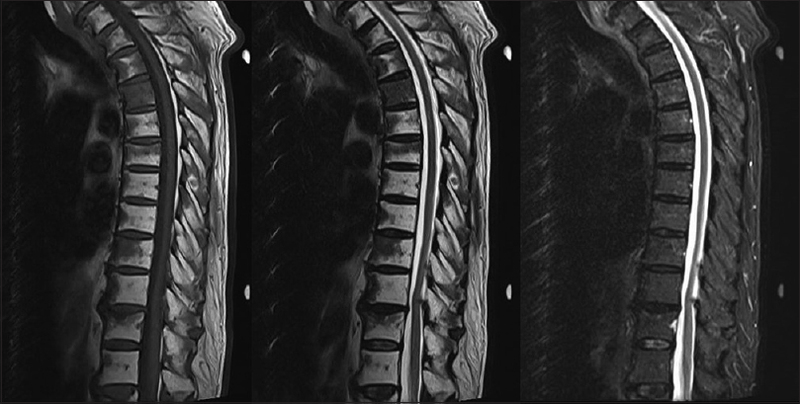 It is also the most common site for osseous metastasis.,, Prognosis for patients with metastatic spinal disease is generally poor, and management options have to be carefully weighted. 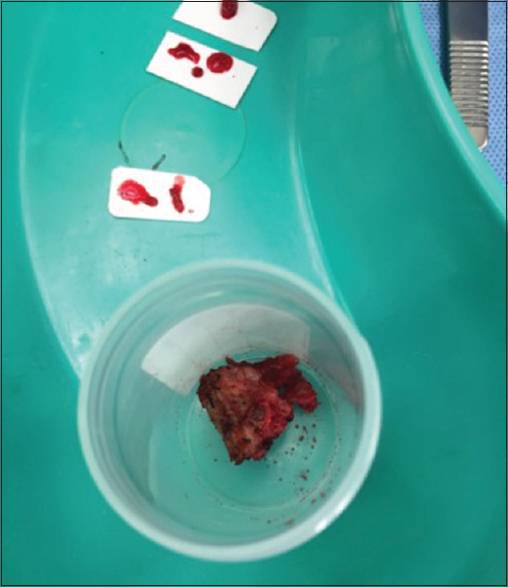 It is, hence, critical to be able to pick up bone marrow lesions which require further investigations and intervention from benign lesions which can be conservatively managed. The appearance of vertebra bone marrow on MRI depends on the relative proportions of fat and water composition. Red marrow, which is hematopoietically active, consists of a higher proportion of water and protein (40% water, 40% fat, and 20% protein)., It, hence, has decrease signal intensity on T1-weighted MRI images, hypointense compared to normal muscles and intervertebral disc. Yellow marrow consists of significantly high proportion of adipocytes (80% fat, 15% water, and 5% protein) and is consequentially similar to subcutaneous fat on T1-weighted sequences., Conversion of red to yellow bone marrow occurs inherently as part of a normal maturation process. HPMM occurs when there is a reconversion of vertebral marrow back to hematopoietically active red marrow. This can possibly occur in times of physiological stress and in certain medical conditions such as in trauma cases, chronic anemia, obesity, and with the use of hematopoietic growth factors. Other factors linked to HPMM include lifestyle habits such as heavy smoking and long distance running.,,,, In this patient, the likely cause was prior trauma from his fall. Typical MRI findings of HPMM have been classically described of that of hematopoietically active red marrow, markedly decreased in signal intensity on T1-weighted MRI sequences, and also low on T2W sequences possibly due to its increase in intracellular iron content. Similarly, bone metastasis demonstrates decreased signal intensity on T1W due to the replacement of normal marrow by neoplastic elements., On T2-weighted and STIR sequences, bone metastasis can have variable signal intensities, dependent on the degree of mineralization, whether the metastasis is osteoblastic, osteolytic, or mixed in nature., Classical descriptors such as “bull's eye sign” as an indicator for normal hematopoietic bone marrow and halo sign as an indicator for metastasis may be helpful with differentiation but are not present in many cases. HPMM remains a clinical entity presenting significant difficulties in diagnostic evaluation for both the orthopaedic surgeon and radiologist. It remains as a false positive pitfall which clinicians must carefully consider when dealing with possible spinal metastasis. A thorough history taking and clinical examination may provide clues to the underlying etiology, but radiographic imaging remains critical for diagnosis. Risk factors for developing HPMM such as prior trauma, use of hematopoietic growth factors, heavy smoking, and long distance running should be elicited when suspecting such instances. Further research should be done to come up with a more definitive diagnostic system, perhaps, risk stratification on the likelihood of spinal metastasis based on clinical and radiographic parameters. With that, we can potentially spare patients from the risks of invasive biopsy and opt for a more conservative approach. Maccauro G, Spinelli MS, Mauro S, Perisano C, Graci C, Rosa MA, et al. Physiopathology of spine metastasis. Int J Surg Oncol 2011;2011:107969. Shah LM, Salzman KL. Imaging of spinal metastatic disease. Int J Surg Oncol 2011;2011:1-12. O'Sullivan GJ, Carty FL, Cronin CG. Imaging of bone metastasis: An update. World J Radiol 2015;7:202-11. Guillerman RP. Marrow: Red, yellow and bad. Pediatr Radiol 2013;43 Suppl 1:S181-92. Shigematsu Y, Hirai T, Kawanaka K, Shiraishi S, Yoshida M, Kitajima M, et al. Distinguishing imaging features between spinal hyperplastic hematopoietic bone marrow and bone metastasis. AJNR Am J Neuroradiol 2014;35:2013-20. Shah GL, Rosenberg AS, Jarboe J, Klein A, Cossor F. Incidence and evaluation of incidental abnormal bone marrow signal on magnetic resonance imaging. ScientificWorldJournal 2014;2014:380814. Małkiewicz A, Dziedzic M. Bone marrow reconversion-imaging of physiological changes in bone marrow. Pol J Radiol 2012;77:45-50. Poulton TB, Murphy WD, Duerk JL, Chapek CC, Feiglin DH. Bone marrow reconversion in adults who are smokers: MR imaging findings. AJR Am J Roentgenol 1993;161:1217-21. Vande Berg BC, Lecouvet FE, Galant C, Simoni P, Malghem J. Normal variants of the bone marrow at MR imaging of the spine. Semin Musculoskelet Radiol 2009;13:87-96. Hollinger EF, Alibazoglu H, Ali A, Green A, Lamonica G. Hematopoietic cytokine-mediated FDG uptake simulates the appearance of diffuse metastatic disease on whole-body PET imaging. Clin Nucl Med 1998;23:93-8. Carolyn Grove S. MRI changes associated with bone marrow reconversion can mimic infiltration with multiple myeloma. J Leukemia 2013;1:125. Yu YS, Li WH, Li MH, Meng X, Kong LI, Yu JM, et al. False-positive diagnosis of disease progression by magnetic resonance imaging for response assessment in prostate cancer with bone metastases: A case report and review of the pitfalls of images in the literature. Oncol Lett 2015;10:3585-90. Ollivier L, Gerber S, Vanel D, Brisse H, Leclère J. Improving the interpretation of bone marrow imaging in cancer patients. Cancer Imaging 2006;6:194-8. Moulopoulos LA, Koutoulidis V. Bone Marrow MRI A Pattern-Based Approach. Milano: Springer Milan; 2015. Schweitzer ME, Levine C, Mitchell DG, Gannon FH, Gomella LG. Bull's-eyes and halos: Useful MR discriminators of osseous metastases. Radiology 1993;188:249-52. Ida S, Watanabe M, Yamao T, Ishimoto T, Nagai Y, Iwatsuki M, et al. 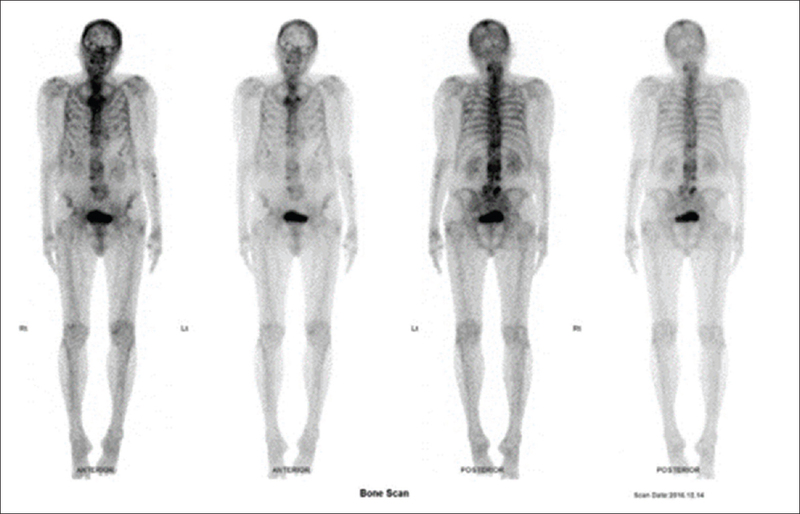 False-positive 18F-fluorodeoxyglucose positron emission tomography (FDG-PET) findings of bone metastasis from esophagogastric cancer: Report of two cases. Surg Today 2014;44:2191-4. Tanaka T, Gobara H, Inai R, Iguchi T, Tada A, Sato S, et al. A case of focal bone marrow reconversion mimicking bone metastasis: The value of 111Indium chloride. Acta Med Okayama 2016;70:285-9.